Simple stitches and beads combine to create this beautiful shawl. The four-row pattern repeat is easy to remember, making this a relaxing crochet project. Easily customizable, crochet the small size and wear it draped to the front bandana-style. 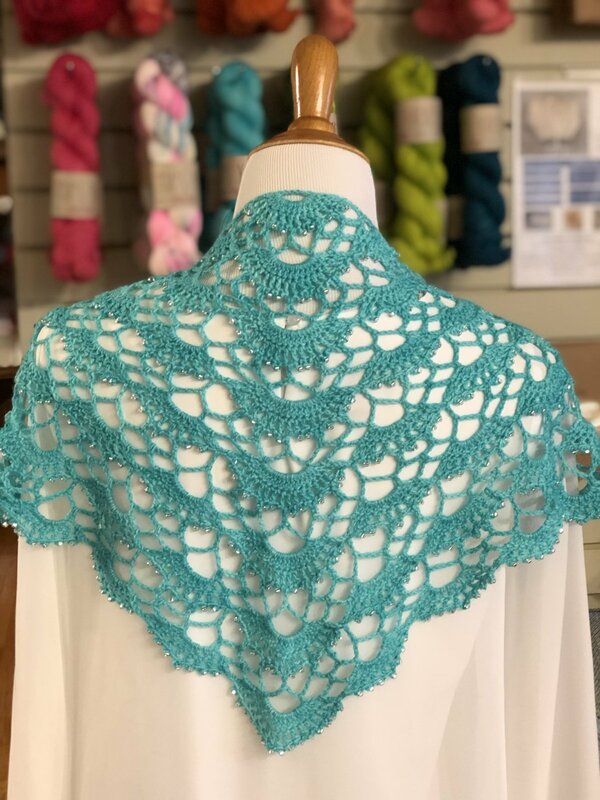 For a larger triangle shawl simply continue with the pattern repeats. Materials: 1 skein Emma’s Practically Perfect Sock yarn, Size F (3.75mm) crochet hook, 1mm steel crochet hook (for beads), Size 6 seed beads (400 beads for small size, 430 for larger size) and pattern. Pattern available for purchase in store.